We’re already a month into 2018, and that means the deadlines for draw hunt applications are approaching fast. The application deadline for bear and turkey permits is on February 7 at 5 p.m. Applications for big-game licenses, meanwhile, can be submitted until 5 p.m. on March 21. 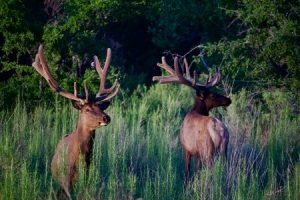 Hunters can easily apply for state licenses and permits on the website of the New Mexico Department of Game and Fish. The Department of Game and Fish is also encouraging hunters to review new rules governing the tagging of harvested game. This year, hunters will need a separate tag in addition to their printed licenses. These tags will automatically be mailed to successful draw hunt applicants, but they will also be available at license vendors and department offices for over-the-counter licenses. All big game and turkeys must be tagged at the time of harvest. You can find the department’s complete tagging guidelines here. If you need assistance with your application, the Department of Fish and Game recommends you call their information center to speak with a representative. The information center will offer extended hours between March 10 and March 20 to meet the anticipated increase in demand for application assistance. If you want to hunt this season, don’t let these applications deadlines pass you by! They’ll be here before you know it. Ready to get out in the field and join us at JACO Outfitters? You can start planning your trip today! If you have any questions, feel free to give us a call or contact us online.